The newly bereaved are at greatly increased risk of heart attack after the death of a close loved one, US researchers say. Heart attack risk is 21 times higher within the first day and six times higher than normal within the first week, a study in the Circulation journal of nearly 2,000 people shows. Symptoms to watch for include chest pain and shortness of breath. 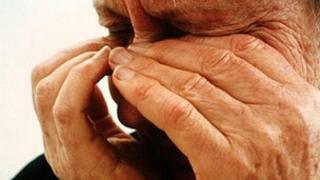 Experts say intense grief puts extra strain on the heart. The psychological stress associated with loss can raise heart rate, blood pressure and blood clotting, which, in turn, can increase the chance of a heart attack. A person's sleep and appetite are also likely to be disrupted. Compound this with self-neglect - such as not bothering to take regular medication - and the result can be grave. The researchers say it is important for family and friends to be aware of these risks and to keep an eye out during such difficult times. Lead investigator Dr Murray Mittleman, of Harvard Medical School's Beth Israel Deaconess Medical Center, said: "During situations of extreme grief and psychological distress, you still need to take care of yourself and seek medical attention for symptoms associated with a heart attack. "Caretakers, healthcare providers and the bereaved themselves need to recognise they are in a period of heightened risk in the days and weeks after hearing of someone close dying." The researchers reached their estimates by studying 1,985 heart attack survivors and comparing how many of them had recently been bereaved. Among the study participants, 270 (13.6%) experienced the loss of a significant person in the prior six months, including 19 within one day of their heart attack. Heart attack risk went up significantly within the first week after the death of a close loved one. The risk was highest in the first seven days following bereavement and declined steadily thereafter. The elevated risk ranged from about one in 300 to less than one in 1,000 depending on the individual's general heart health before bereavement. Those with a history of heart disease already fared worse. Prof Peter Weissberg of the British Heart Foundation said: "We're already aware that, under exceptional circumstances, emotional stress can trigger a heart attack. "But we shouldn't lose sight of the fact that heart attacks triggered by stress normally only happen in people with underlying heart disease. It's very important that if you're taking medication because you have, or are at high risk of, heart disease, don't neglect taking it following a significant bereavement." Past research has already shown that recently bereaved people have heart rhythm changes which may make some of them more vulnerable to health problems. And grieving spouses have higher long-term risks of dying, with heart disease and strokes accounting for around half of the deaths, findings suggest.